Year three time worksheets help teach your child about months, days, and hours. Your student will exercise his time-telling skills to add hands to analog clocks, find elapsed amounts of time, and read a calendar. Help your seven- or eight-year-old manage his time well with these year three time worksheets. Tick-tock, watch the clock! Help your child practise telling time with an analog clock. Help the concept of time sink in for your second grader with this worksheet that asks her to answer a few questions about Nina's busy schedule. 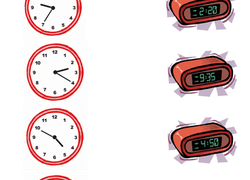 Kids practise telling time to five minutes by reading the clocks and writing the time in digital form. From reading a clock to adding time, this quick quiz covers a variety of year three time concepts. What time do you wake up in the morning or start school? Have students flex their time-telling skills by matching analog and digital clocks, all while keeping track of common morning activities. Flex your time muscles by practising telling time on the quarter hour. Your students have mastered reading time to the hour and half hour, but how are they doing with trickier times, such as 9:10 or 1:35? Use this worksheet to assess your student’s abilities to tell analog time to the nearest five minutes. 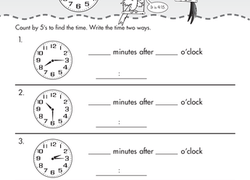 Telling time can be tough, but with the help of this easy worksheet, it can be a breeze! A number line is one way students can determine elapsed time. Use this quick assessment to help you gauge student understanding of elapsed time by having them create their own number lines to find the answer. Telling the Time Made Easy! 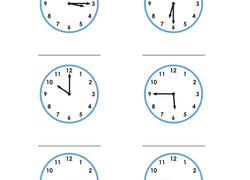 Telling the time is made easy in this worksheet with six clocks all displaying different times. Read the clock and write the time in the space provided. 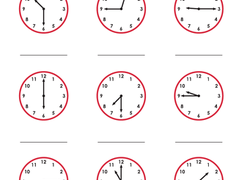 Your second graders should be well on their way to mastering analog clock reading by now. 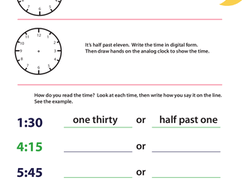 Use this double-sided worksheet to assess your students' abilities to tell analog time to the nearest five minutes—with am and pm! Strengthen your time-telling skills by identifying the time to the hour, then drawing the hands on the analog clocks. Help your second grader get accustomed to the brand new world of reading clocks with this adorable printable!